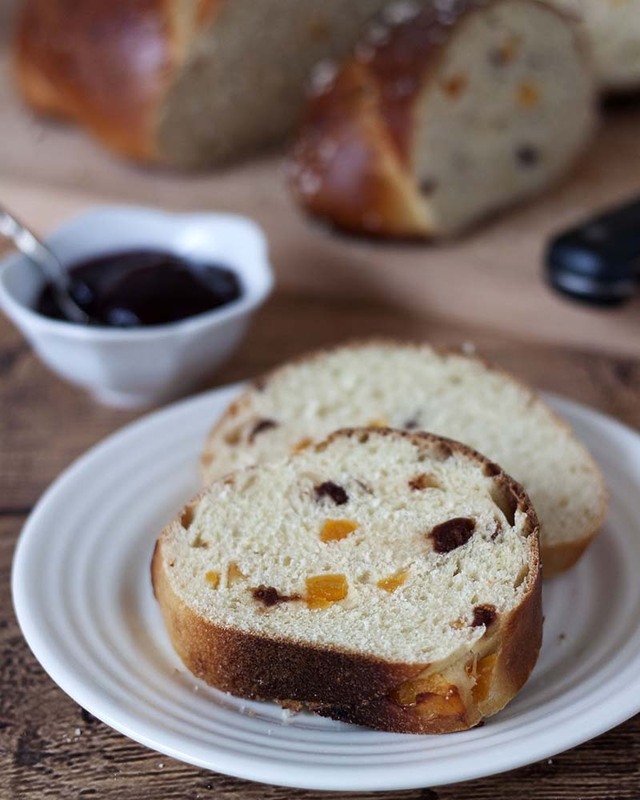 This Apricot Cherry Breakfast Bread is a sweet, light, tender bread studded with dried apricots and tart cherries. Serve it for breakfast slathered with your favorite jam. necessary. Add dried fruit. Knead for 5 minutes until smooth and elastic. Punch down dough. Turn dough onto lightly floured surface. Pat into a 12x6-inch rectangle. Cut into two 3x12-inch piece. Shape each piece into a rope. Twist the ropes together. Place on a greased cookie sheet. Cover; let rise until indentation remains after touching. and sprinkle with pearl sugar. Bake in preheated 400°F oven 15 to 20 minutes. Cool completely before serving. This is excellent bread! I will use more fruit next time. It’s very moist, not overly sweet. My husband loved it too.